Radiation dose received by patients during invasive cardiology procedures has the potential to cause skin damage and is assumed to include a small cancer risk. To help ensure patient safety, it is desirable to minimize patient radiation dose to patients undergoing these procedures. An inherent benefit of reduced patient dose is reduced dose to physician operators and staff. Previous studies have tested patient radiation dose-reduction initiatives for radiofrequency ablation and invasive coronary artery procedures. 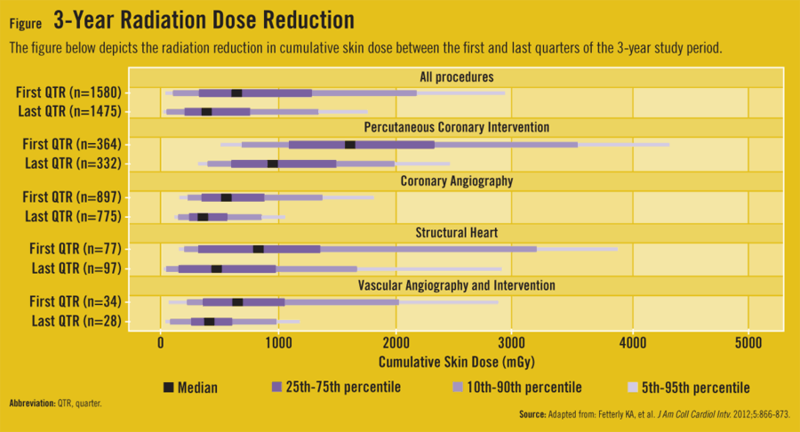 Few studies, however, have explored the effects of using sustained patient radiation dose-reduction initiatives in larger, diverse invasive cardiovascular settings. Establishing a multidisciplinary catheterization laboratory radiation safety committee. Announcing radiation doses during procedures at 3,000 mGy intervals to increase awareness and minimize high-dose procedures. Documenting the radiation dose in final reports upon conclusion of procedures. Mandating that fellows be trained on x-ray imaging and radiation safety. Increasing spectral filtration for acquisition imaging. Setting the default fluoroscopy program to a low dose rate. Reducing the fluoroscopy frame rate to 7.5 frames per second. Reducing dose rate targets for acquisition imaging. “The intent of our intervention was to foster a philosophy of radiation safety,” explains Dr. Fetterly. “It was hoped that implementing this collection of progressive changes could decrease the radiation dose administered to patients as well as staff.” Altogether, 18,115 procedures were performed by 27 staff cardiologists and 65 fellows-in-training in the study. 34% for structural heart procedures. 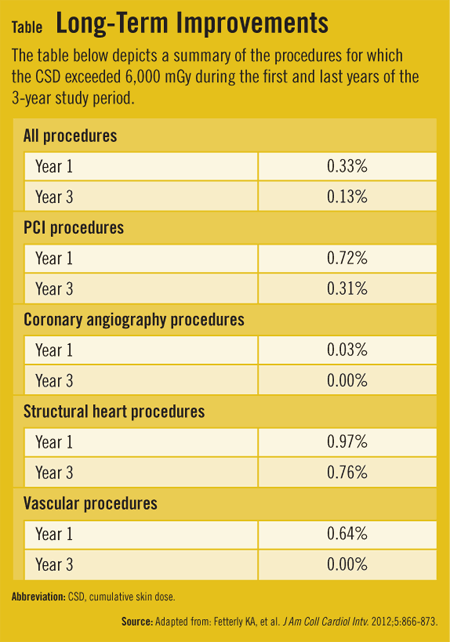 53% for vascular angiographic and interventional procedures. These changes were the result of reducing both image acquisition radiation dose to the skin by 46% and fluoroscopy skin dose by 33%. When assessing cumulative skin dose exceeding the high-dose threshold of 6,000 mGy, the investigators observed a decrease from 0.33% in the first year of the intervention to 0.13% in the third year (Table). The average radiation exposure to patients dropped by 40% overall, decreasing from a cumulative skin dose of 969 mGy to 568 mGy across interventional procedures. Radiation scatter that results in occupational dose is directly proportional to patient dose. As such, the study team noted that reductions in patient dose could be expected to have a complementary effect on radiation dose to staff. Fetterly KA, Mathew V, Lennon R, et al. Radiation dose reduction in the invasive cardiovascular laboratory: implementing a culture and philosophy of radiation safety. J Am Coll Cardiol Intv. 2012;5:866-873.Available at: http://interventions.onlinejacc.org/article.aspx?articleid=1352152. Fetterly KA, Lennon RJ, Bell MR, et al. Clinical determinants of radiation dose in percutaneous coronary interventional procedures. J Am Coll Cardiol Intv. 2011;4:336-343. Lakkireddy D, Nadzam G, Verma A, et al. Impact of a comprehensive safety program on radiation exposure during catheter ablation of atrial fibrillation: a prospective study. J Interv Card Electrophysiol. 2009;24:105-112. Rogers DP, England F, Lozhkin K, et al. Improving safety in the electrophysiology laboratory using a simple radiation dose reduction strategy: a study of 1007 radiofrequency ablation procedures. Heart. 2011;97:366-370. Kuon E, Glaser C, Dahm JB. Effective techniques for reduction of radiation dosage to patients undergoing invasive cardiac procedures. Br J Radiol. 2003;76:406-413. Delichas MG, Psarrakos K, Molyvda-Athanassopoulou E, et al. Radiation doses to patients undergoing coronary angiography and percutaneous transluminal coronary angioplasty. Radiat Prot Dosimetry. 2003;103:149-154. Samara ET, Aroua A, Staffer JC, et al. Fluoroscopy-guided procedures in cardiology: is patient exposure being reduced over time? Radiat Prot Dosimetry. 2010;139:271-274. Kenneth A. Fetterly, PhD, has indicated to Physician’s Weekly that he has or has had no financial interests to report.